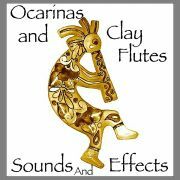 Ocarinas and Clay Flutes is now available as a WAVE disk for import into other software besides Kontakt And Reason. It includes the haunting sounds of the native American flutes of north and central America. Four different clay flutes and three ocarinas, played so that they create sweet or sorrowful, straight, vibrato, or wild calls, screeches, or tonal or microtonal trills, or bird calls. The samples are presented with lots of velocity switches, or controller switches, so that a straight note can easily become a 1/2 step breathy slide up or down, a nasty screech, or a wild haunting trill, or fade into overblown.